Mrs. Williams grew up in Boise and attended Boise public schools. After her high school graduation, she went on to study at Boise State University where she earned her BA in both Elementary Education and General Music. She later earned her MA in literacy education from BSU and is a certified K-12 Reading Specialist. In addition to being certified as an elementary teacher, Mrs. Williams is also highly qualified to teach middle school English, reading, music, and social studies. 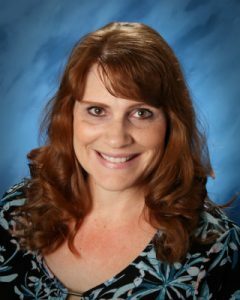 Mrs. Williams started her teaching career in 1996 in the Meridian School District (now West Ada) where she taught second and fifth grades. In 2000 she moved to Fruitland and joined the FMS team as a fifth grade teacher. In 2003 she started teaching eighth grade and has been teaching this grade ever since. Mrs. Williams is married to the high school band director, and they have two daughters. In her spare time, Mrs. Williams enjoys spending time with her family and friends, reading, watching movies, and playing her flute.